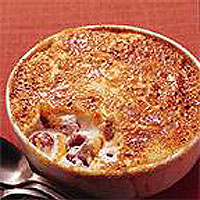 A quick and easy brûlée-style dish which uses some of the best fruits of the season. Use the grapefruit and orange as a base, but add whatever fruits you have available. Clementines and satsumas also make a good choice. Mix the fruit together and place in a heatproof serving dish. Spread the yogurt evenly over the fruit. Preheat the grill to its highest temperature. Sprinkle the demerara sugar over the yogurt then place the dish under the grill for about 8-10 minutes until the sugar has caramelised evenly, without burning. Cool, then place in the refrigerator until ready to serve. Once the sugar has been added, grill immediately before it dissolves. For those not counting calories, replace 250g of the yogurt with extra thick cream. This dish can be made in advance and kept chilled until needed, but use on the day of preparing. Reserve the juice when preparing the grapefruit and add to a salad dressing with olive oil and salt and pepper, or combine with orange juice as a drink.